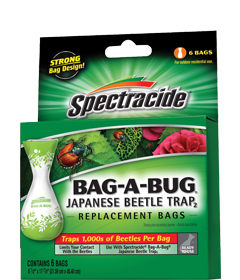 Spectracide Bag-A-Bug bags have an hourglass shape that traps thousands of beetles, preventing them from escaping. Attach a disposable bag to the yellow Bag-A-Bug trap vane assembly as shown. Gently push a small slit on the open end of the bag over each of the hooks on the vanes. Be careful not to tear or stretch the slits. Drop a few small pebbles into the bag to stabilize the trap in windy conditions. NOTICE: Buyer assumes all responsibility for safety and use not in accordance with directions.